Super Deluxe is an upcoming Tamil film written, produced and directed Thiagarajan Kumararaja that has an ensemble cast comprising of Vijay Sethupathi, Fahadh Faasil, Samantha Akkineni, Ramya Krishnan, Mysskin, Gayathrie, Bagavathi Perumal and others. This film marks Thiagarajan Kumararaja's return to cinema after he made his debut through the cult film Aaranya Kaandam, 8 years ago. The trailer was released a couple of days ago, and received a terrific response from the audience. One of the key elements of the trailer, that received tremendous amounts of praise was Vijay Sethupathi's voice over. 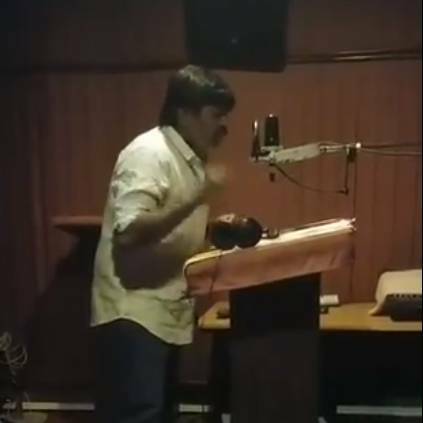 Now, the makers have released the video of Vijay Sethupathi dubbing for the trailer. This project is produced by the director himself, under the banner Tyler Durden and Kino Fist, along with East West Dream Work Entertainment, and Alchemy Vision Workz. His earlier film Aaranya Kaandam is still considered to be one of the best films of Tamil cinema. It was also the first Neo-noir Tamil film to be made. Slated for a release on March 29, the film has music by Yuvan Shankar Raja, while Nirav Shah and P.S Vinod are the cinematographers. Gopi Prasanna has designed the poster and the screenplay is written by Neelan K Shekhar, Mysskin and Nalan Kumarasamy. People looking for online information on Mysskin, Samantha Akkineni, Super Deluxe, Thiagarajan Kumararaja, Vijay Sethupathi, Yuvan Shankar Raja will find this news story useful.